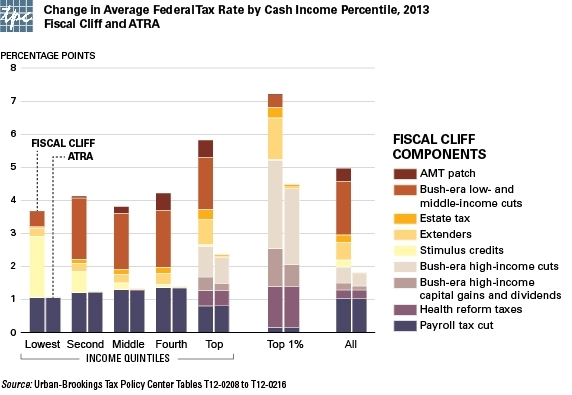 The bars on the left for each income group show what would have happened if we had toppled over the cliff. On average, federal tax rates would have increased by nearly 5 percentage points (a huge tax hike by any standard). Each bar also shows the elements of that tax hike—how much would have come from the end of the Bush-era tax cuts, the expiration of the payroll tax cut etc. Each right-hand bar shows what did happen under ATRA. The average increase in federal tax rates will be less than 2 percent this year–not even half the increase if we’d tumbled over the edge. Except for the highest-income households, pretty much all of it is caused by the return of payroll tax rates to pre-2010 levels. All of these numbers are relative to the tax rules in place in 2012 with a patched Alternative Minimum Tax and the payroll tax cuts still in place but with the Obamacare tax increases not yet in effect. When you look at the details of what would have happened had Congress gone over the cliff, you can see how much of what was at stake for most households had nothing to do with the Bush tax cuts. For instance, the payroll tax cut, the relatively generous refundable tax credits, and the 2010 health reform law’s tax increases were all President Obama’s doing. The AMT in its modern form was invented in the Reagan Era. Overall, only about half of 2013′s tax increases would have resulted from the expiration of the Bush tax cuts. You also see what going over the cliff would have meant to households in various income groups. In short: The highest-income one percent would have gotten hammered. Their average tax rate would have gone up by more than 7 percentage points. But we didn’t go over the cliff. And, under ATRA, the picture is quite different. The distribution of tax increases among households in each of the bottom four income groups is pretty flat. The lowest earning 20 percent will face an average increase in their 2013 tax rates of about 1.1 percentage points, while middle-income households will pay rates that are about 1.3 points higher. By contrast, those in the top 20 percent will see their average rate rise by about 2.5 points and while the top 1 percent pay 4.5 percentage points more. While the story for the vast majority of households is about the payroll tax, it is quite different for those at the very top. Among the highest income one percent, the payroll tax cut accounts for only about 0.1 of a point of that total 4.5 percent increase. For them, the end of the Bush-era rates on both ordinary income and capital gains plus the new Obamacare investment taxes are far more important. Thanks to the Urban Institute’s Tim Meko for digitally painting this one.